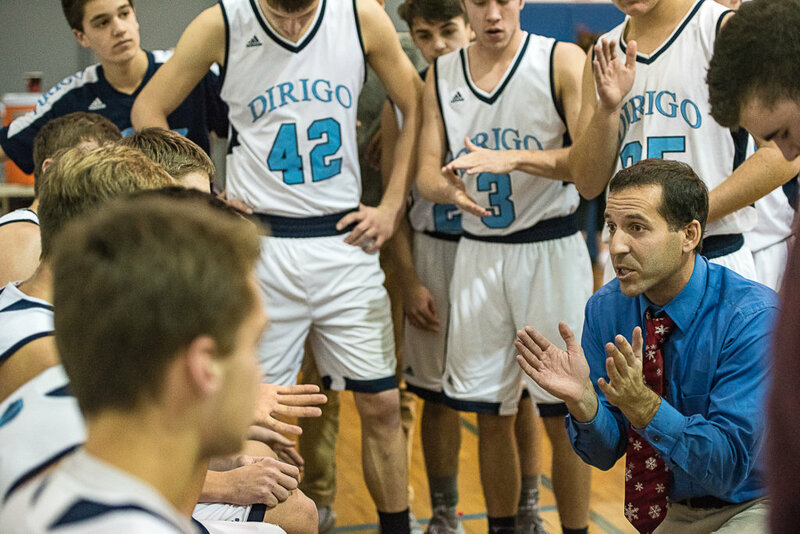 Travis Magnusson has stepped down from his position as Dirigo High School’s boys’ basketball coach after seven years at the helm. Magnusson, 34, sent his letter of resignation to the athletic department early Thursday. He cited the difficulty of making the commute from his home in Readfield to the Dixfield school as one of the reasons he’s stepping aside, as well as trying to maintain the program’s success while raising a young family. He and his wife, Karen, who served as his assistant the past two years after serving as the Dirigo girls’ basketball head coach from 2014-2016, have two sons, ages four-and-a-half and one-and-a-half. His father, Marty, also served as an assistant coach. “It was really hard to make that decision. Coming to Dirigo is one of the best decisions I ever made,” said Travis Magnusson, who spent four years as boys’ basketball head coach at Livermore Falls High School before that school merged with Jay High School to become Spruce Mountain. “We had so much success, but the biggest thing was the relationships I had with players and families were very valuable to my whole family,” he added. At Dirigo, Magnusson compiled a 118-29 record, winning four Mountain Valley Conference titles, regional titles in 2012 and 2015, and the Class C state championship in 2012. The Cougars went undefeated at home in six of his seven seasons, winning 45 in a row at one point. Last season, the Cougars finished 12-7, losing in the C South quarterfinals to Richmond. Last season was also Dirigo’s first without a junior varsity team due to budget cuts, a source of frustration for Magnusson and other coaches in the district. He said he believed Dirigo would be better served with a coach who lived in the community and/or had a history with Dirigo basketball. He also added that he plans to coach again, possibly as soon as next season. Magnusson, who scored over 2,000 points for Georges Valley before the school merged with Rockland to become Oceanside, said he enjoyed the family atmosphere of the school while gaining some insight on what made one of his former rivals so successful.